Magic is well and good, but bullets are often swifter. Brief Cases (2018) is a collection of a dozen short stories set in the world of Harry Dresden, a private investigator and talented wizard living in Chicago. Harry is the main character in most of the stories, but not all; a few other characters in Jim Butcher’s DRESDEN FILES universe get their chance to relate their adventures in their own voices. The warlock she’s been sent to apprehend turns out to be a lot more trouble, and have more friends helping him, than Anastasia anticipated. For her part, she gets some assistance from a näcken, a treacherous shapeshifting water spirit (usually in the shape of a horse) who lost a bet to her, and a particular deputy who will be familiar to anyone who knows anything about the Old West. I was tickled pink to meet him in this tale! Another particular standout is the last novelette, Zoo Day, where the same period of time and overlapping events are related by Harry Dresden and two other characters, a young girl named Maggie (who will be familiar to readers of the series) and an enormous and magical dog ironically named Mouse. Harry, Maggie, and Mouse take a trip to the zoo one day, where several different magical threats turn up to disrupt what was supposed to be a pleasant outing. Each of these three characters offers his or her own perspective on the events of that day, building on each other’s stories. It was insightful and even touching. “B is for Bigfoot,” “I Was a Teenage Bigfoot” and “Bigfoot on Campus” (previously printed in Working for Bigfoot, which Tim and Kat have reviewed) are the enjoyable trio of stories about the son of Bigfoot by a human woman, a six foot-four inch archeologist. Irwin, their son, is an intelligent and (understandably) physically strong young man, but has typical growing-up troubles with bullies, school teachers, and first love. Of course, there’s a magical twist to all of these problems. These stories explore some of the problems and concerns of parenting, with a Sasquatch spin. These twelve stories in Brief Cases are set at various points in the DRESDEN FILES series and, fair warning, there are some significant spoilers relating to things that happen to some key characters in some of the later books of the series. It’s also helpful to be at least somewhat familiar with the series before launching into reading these stories. I’m somewhat a newbie to Harry Dresden: so far I’ve read only the first and fourth books in the series, but that was enough to anchor me for these stories. The idea of the consequences of your actions coming back to you in the future is ingrained in the fabric of the Dresden Files ― and both your terrible choices and your more inspired ones engender consequences that will eventually come home to roost. Other than Zoo Day, which is new, all of these stories have appeared in various previously published anthologies. 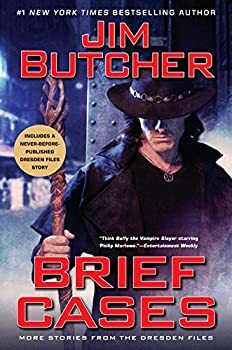 Brief Cases is well worth reading for fans of the DRESDEN FILES series, but might be slightly confusing for readers who aren’t at least a little familiar with the Dresden universe and characters. Published in June 2018. An all-new Dresden Files story headlines this urban fantasy short story collection starring the Windy City’s favorite wizard. The world of Harry Dresden, Chicago’s only professional wizard, is rife with intrigue—and creatures of all supernatural stripes. And you’ll make their intimate acquaintance as Harry delves into the dark side of truth, justice, and the American way in this must-have short story collection. From the Wild West to the bleachers at Wrigley Field, humans, zombies, incubi, and even fey royalty appear, ready to blur the line between friend and foe. In the never-before-published “Zoo Day,” Harry treads new ground as a dad, while fan-favorite characters Molly Carpenter, his onetime apprentice, White Council Warden Anastasia Luccio, and even Bigfoot stalk through the pages of more classic tales. With twelve stories in all, Brief Cases offers both longtime fans and first-time readers tantalizing glimpses into Harry’s funny, gritty, and unforgettable realm, whetting their appetites for more to come from the wizard with a heart of gold. These all sound fun! And this is the aspect of the Dresden books that I enjoyed the most, rather than the endless battle-mage stuff, so this is probably a book for me.